Being a chicken owner, I have a fondness for eggs. Farm fresh, backyard raised eggs with bright yellow yolks and hard to crack shells. I also love to cook breakfast for guests, so I was thrilled to stumble upon a baked egg recipe that is super easy to make, and looks a bit ‘fancy’ without much effort. (Admit it: It’s nice to have simple recipes that make you look stunning in the kitchen!) 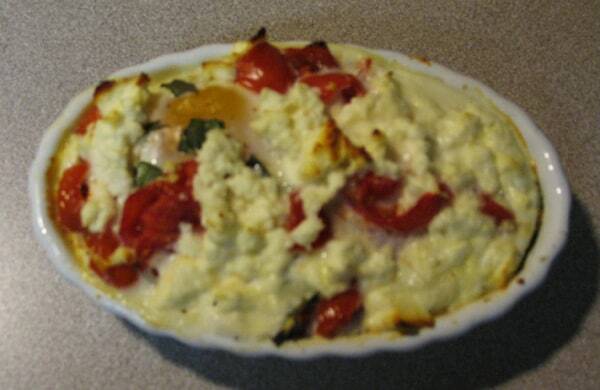 The original recipe for these baked eggs includes fresh basil, bacon, tomatoes, and cheese. But I’ve come up with several more winning combinations, which are easy to customize for individual tastes without much extra effort. Preheat the oven to 325. Prepare one ramekin per person by spraying with non-stick cooking spray. Crack one or two eggs into each dish (depending appetite of your guests). Pour in a teaspoon of milk on top of the egg (don’t stir, leave the egg whole). Add a sprinkle of salt and pepper. And then the fun variations begin! 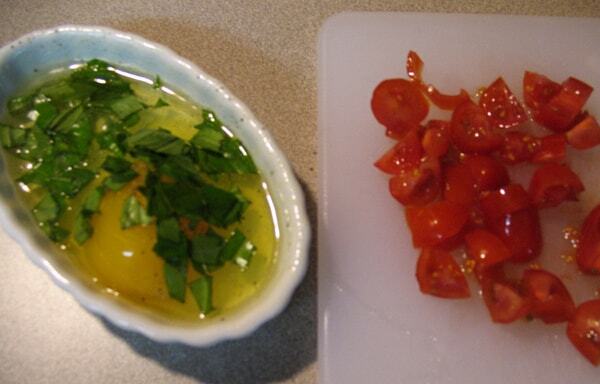 For example, a favorite for my guests is chopped fresh basil, chopped fresh tomato, and crumbled feta cheese. Another is chopped fresh cilantro, salsa and pepper jack cheese. Grilled onions, pre-cooked (and chopped or crumbled bacon) and cheddar cheese is also pretty tasty, as well as using leftover taco meat and refried beans with salsa, cheese and sour cream. You get the idea. The possibilities are really endless. Once you’ve assembled your creations, place in the oven and bake for 12-15 minutes. You want the whites to be cooked and the yolks to be set but not totally firm. These baked eggs have become my ‘signature’ (and most requested) breakfast meal for guests. Add some hash browns and or toast and some sliced fresh fruit and you’ve got a personalized, ‘restaurant’ quality meal without much effort. If you make these baked eggs for your family and friends, be prepared for breakfast hall of fame. And for repeated requests for this recipe in all its endless variations.